Add stylish support and ideal sound transfer for your Sound Bar with the CorLiving MCS-408-S wall mounted shelf. One narrow extra wide shelf can present your Sound Bar beneath your wall mounted TV for the ultimate in sound and look. Easy to mount, this shelf can hold up to 11lbs. Display your high value component safely up and out of the way and free up space in your home. AVT shelves provide an elegant, small footprint solution to organizing your home theater. Mounted to the wall to save space, their modular design gives you the freedom to add as many as needed to carry your PVR, gaming consoles and other A/V devices. Each unit features a tempered glass shelf that is height adjustable and can support up to 20 pounds. A powder coated aluminum cover is also included to hide your cables, while endcaps ensure a clean and refined appearance. Choose between one, two and three-shelf models to accommodate your needs. The minimalist, off-the floor design of the Altus Plus eliminates the need for a separate wall-mount TV bracket and is the perfect pairing for any flat screen TV up to 60. At 58 inches wide, it boasts three compartments for A/V components and a bottom shelf for media with room for 137 Blu-Ray Discs or 93 DVDs. Cables & power bars can be neatly concealed to maintain a clean, modern look. When installed according to the manufacturers directions, the Altus Plus has a 165lb weight capacity which will accommodate most flat screen TVs and A/V components. Installing the Altus Plus at any height is simple, thanks to its innovative metal hanging rail mounting system. Available in deep black and rich espresso laminate finishes. Proudly manufactured in Canada using CARB-compliant, laminated composite wood. Ships Ready to Assemble with an instruction booklet for easy assembly and links to an installation video. Includes a 5-year manufacturers limited warranty. Give any room a dash of modern style with our innovative Altus Wall Mounted Audio/Video Console. Finished in goes-with-everything black, this sleek yet functional console offers two generous storage compartments. The main shelf is 15 inches deep, providing ample space for your cable box, DVR or other media components. The bottom shelf has room for over 100 of your most-watched Blu-Ray discs or for whatever else you're storing high above your freed-up floor space! Cables are neatly concealed to give the console a professional, minimalist look. Installing this AV console at any height is simple, thanks to our innovative hanging rail mounting system. MCS-408-S Sound Bar Wall Shelf Add stylish support and ideal sound transfer for your Sound Bar with the CorLiving MCS-408-S wall mounted shelf. One narrow extra wide shelf can present your Sound Bar beneath your wall mounted TV for the ultimate in sound and look. Easy to mount, this shelf can hold up to 11lbs. Display your high value component safely up and out of the way and free up space in your home. 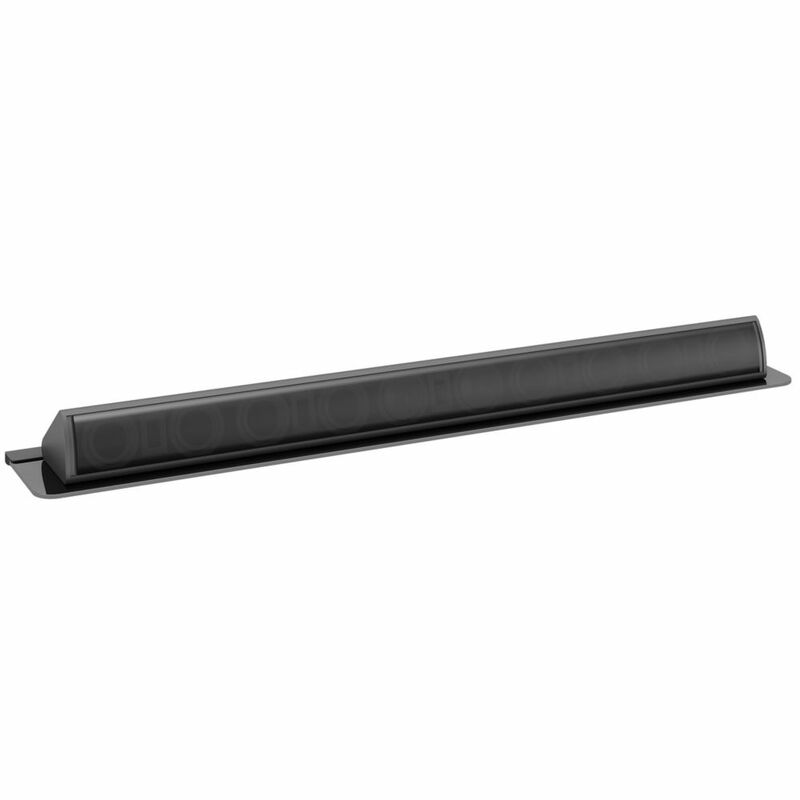 MCS-408-S Sound Bar Wall Shelf is rated 5.0 out of 5 by 1.